Weinberger was born into a prosperous Jewish family in Berlin. Following the rise of the Nazis his family moved to Czechoslovakia in 1933, but this only brought temporary relief. Weinberger left Czechoslovakia for England with his sister, Ina, on the last Kindertransport in 1939, and after a spell at Amersham college became an apprentice toolmaker. He joined the Queen’s Own Royal West Kent Regiment in 1944, and subsequently transferred to the Jewish Brigade where he served in Italy. 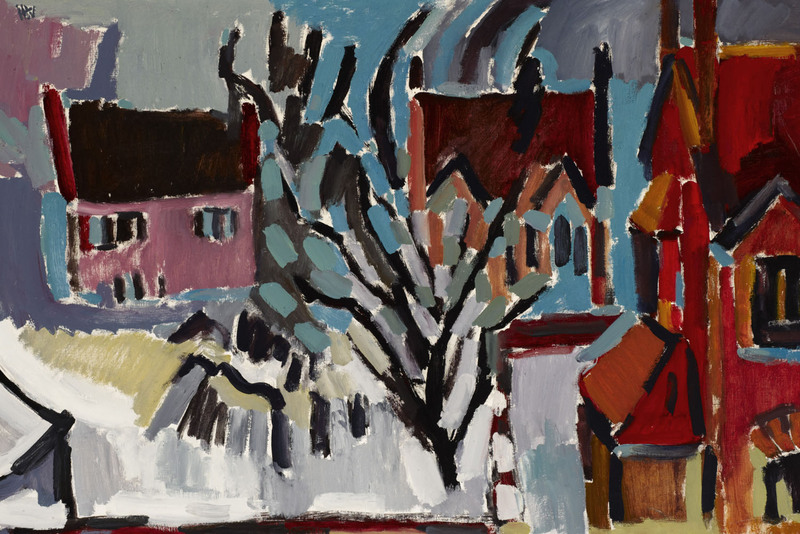 After the war Weinberger enrolled at Chelsea College of Art, where he studied under Ceri Richards, then moved to Goldsmiths College, but his main influence was fellow emigré, painter Martin Bloch, through whom Weinberger established and developed his signature style and subject matter. On Weinberger’s artistic lineage, Iris Murdoch considered the Impressionists and Cubists to have been his immediate ancestors, as well as Van Gogh and Matisse, but she concluded that ultimately Weinberger’s vision was always his own. After the war, with the help of his ex-serviceman's grant, Weinberger trained under Ceri Richards at Chelsea School of Art, where his Expressionist style and use of colour was out of kilter with the prevalent Euston Road style. Although he completed his training at Goldsmiths, he benefitted most from the private painting lessons he took under Martin Bloch, who helped him develop his signature style and rich palette. Weinberger's friend, the writer Iris Murdoch described him as 'a great painter whose genius is not well enough known. His works relate us to the deep emotions and profound joys of the early periods of the century when painting was a great universal exploration: impressionism, post-impressionism, fauvism, symbolism, expressionism, when painters adored paint and worshipped colour, inspired by passion and controlled imagination and courageous faith in their art'.